Management strategies for achieving the water quality goals involve using a combination of structural and non-structural Best Management Practices, as well as an adaptive management approach. Implement structural BMPs throughout the watershed to reduce sediment and phosphorus runoff from existing development. Educate landowners through the NHDES Soak Up the Rain program, BMP demonstration sites, workshops, and other communication strategies, targeting high priority properties with inadequate buffers and/or potentially-malfunctioning septic systems (>25 years old, within 50 feet of a waterbody, and rarely pumped out). Institute greater controls on new and re-development, require LID in site plans, and encourage regular septic system maintenance. These objectives and more are discussed in greater detail in the Action Plan (Section 5.2). Achieving the goals and objectives for future implementation work in the MBI watershed will require a comprehensive and integrated set of activities as identified below. Address high priority sites with an emphasis on cost-efficient fixes that have a high impact to low cost per kg of phosphorus treated. Work with landowners to get commitments for treating and maintaining sites. Workshops and tours of demonstration sites can help encourage landowners to utilize BMPs on their own property. LWA and the town of Moultonborough hosted a ‘Landscaping for Water Quality’ workshop on March 30, 31, 2017, which was attended by 30 landscaping professionals. The workshop utilized the Balmoral Clubhouse as a field exercise for generating landscaping recommendations to improve stormwater runoff. The Balmoral community implemented two of the recommendations, stabilizing an eroding slope and defining a foot path with infiltration steps. Work with experienced professionals on sites that require a high level of technical knowledge (engineering) to install, and ensure proper functioning of the BMP. UNH Stormwater Center generated BMP designs and cost estimates for two sites, both in the direct shoreline drainage area of Basin 3 (Appendix E). Site 1-23: Glen Forest Drive, Balmoral. Eroding ditch near inlet to lake. Site 2-05: Balmoral Beach, shoreline is eroding along several hundred feet. Valuable habitat lost. Measure the pollutant load reduction for each BMP installed (see below). 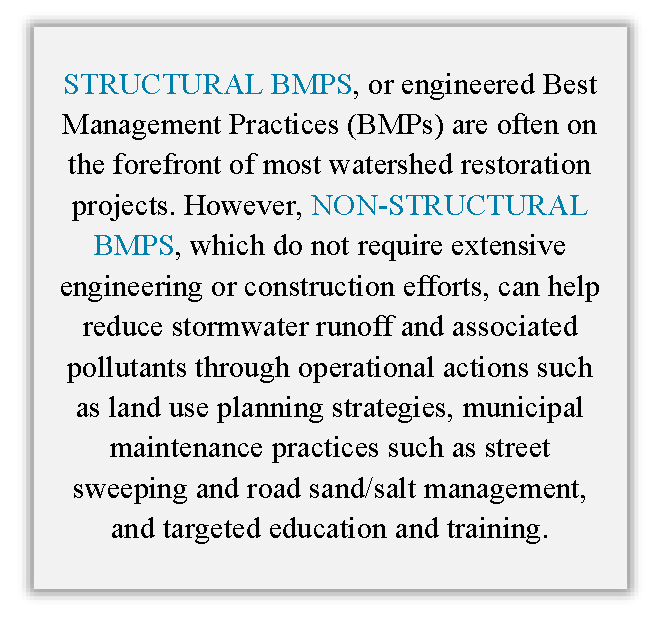 These basic criteria will help guide the proper installation of BMPs in the watershed. Refer to the Action Plan in Section 5.2 and conservation practice fact sheets provided by the Cumberland County Soil & Water District for a continued discussion of BMP implementation strategies (CCSWD, 2014). In total, the top 20 sites identified in the watershed survey will reduce 21 kg P/yr and cost $52,536 to implement and maintain over the next ten years (Table 4.1; refer to Section 5.4 and Appendix D). 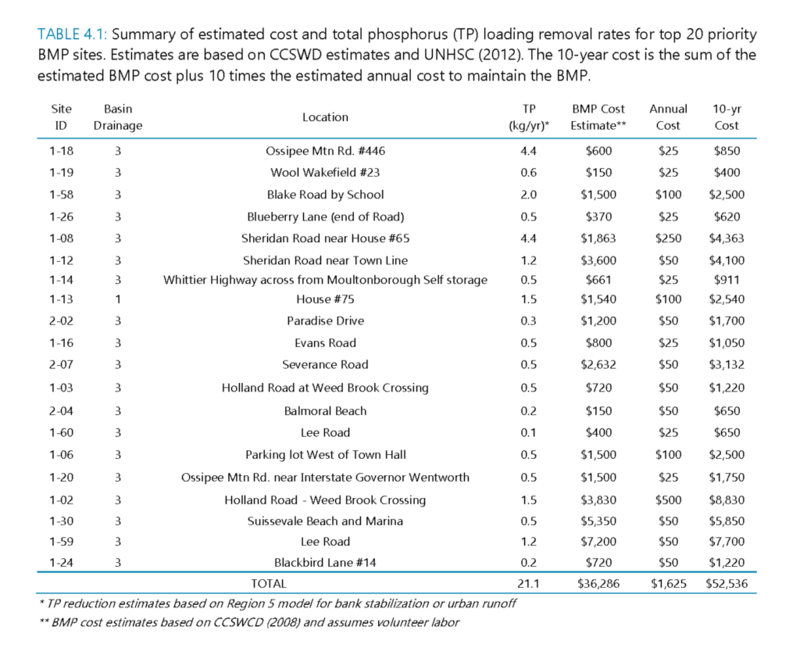 These estimates are based on the Region 5 model for estimating pollutant load reductions. Only one site (1-13) was identified within the drainage to Basin 1; the remaining 55 NPS sites were identified within the drainage to Basin 3. It is recommended that another survey be conducted to target the Basin 1 drainage area, if the Advisory Committee decides to pursue Basin 1 for priority implementation projects. 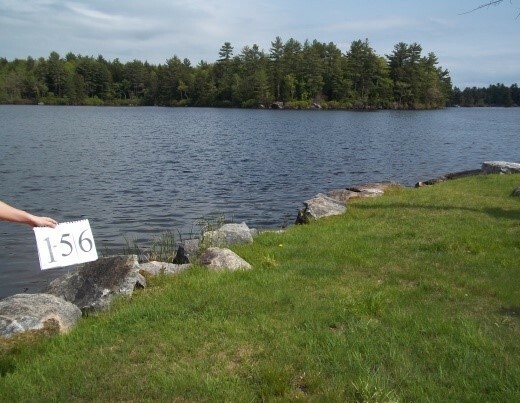 Using a simple scoring method, the shoreline survey served as an excellent tool for highlighting shoreline properties around MBI that exhibited significant erosion (refer to Section 3.4). This method of shoreline survey is a rapid technique to assess the overall condition of properties within the shoreland zone; but it does not allow for making specific recommendations for BMP implementation. Therefore, high priority properties (6 parcels), plus medium priority properties (330 parcels), around MBI should be resurveyed in person for specific BMP recommendations and more accurate estimated phosphorus reductions and implementation costs by site. However, given some broad assumptions (100 ft shoreline contributing 4.7 kg P/yr), the high priority properties around the shorelines of Basins 1, 2, and 3 likely contribute 0, 14, and 14 kg P/yr and would cost $0, $9,000, and $9,000 to revegetate and mulch with volunteer labor, respectively (Table 4.2; refer to Appendix F). The medium priority properties around the shorelines of Basins 1, 2, and 3 likely contribute 27, 51, and 153 kg P/yr and would cost $57,000, $109,500, and $328,500 to revegetate and mulch with volunteer labor, respectively (Table 4.2; refer to Appendix F). All together assuming 50% BMP efficiency for shoreline sites, these priority BMPs would reduce 15, 33, and 103 kg P/yr to Basins 1, 2, and 3, respectively (Table 4.3). Implementing these BMPs would cost about $565,536. These reduction estimates more than meet the goal for Basin 2, which requires a 31% (27 kg/yr) phosphorus load reduction. For the other basins, these reduction estimates only meet roughly half the goals for Basins 1 and 3, which require a 42% (26 kg/yr) and 20% (242 kg/yr) phosphorus load reduction, respectively. To meet these goals, an additional 11 kg P/yr and 139 kg P/yr would need to be reduced to Basins 1 and 3, respectively. These reductions could be achieved as new sites are identified and added to the BMP matrix, as site-specific BMPs are implemented along shorelines, enabling more accurate, and likely higher, phosphorus load reduction estimates, and as shoreline BMPs are implemented along Lees Pond or other waterbodies within the watershed. In addition, non-structural BMPs implemented throughout the watershed will help to further reduce the phosphorus loading to MBI. Non-structural watershed restoration practices prevent or reduce stormwater related runoff problems by reducing the exposure and generation of pollutants and providing a regulatory framework that minimizes impervious surfaces. Non-structural approaches to watershed restoration can be the most cost-effective and holistic practices within a watershed management framework. The non-structural approaches recommended in this plan can not only improve water quality, but can also enhance watershed aesthetics (e.g., through shade tree planting and landscaping), streamline the permitting process (e.g., by removing conflicting design or stormwater codes), and reduce development costs (e.g., by minimizing impervious area development). Good housekeeping measures and education/training to promote awareness. Take additional measures to reduce impervious surfaces. Consider approving a septic system ordinance that requires regular maintenance and inspections. LWA and other project stakeholders have taken great measures in educating residents about the potential adverse effects of phosphorus-based detergents. In 2009, New Hampshire revised its Prohibited Products Statutes to prohibit the distribution, sale, or offering for sale any household cleansing products containing phosphorus (485-A:56). In 2010, sixteen other states followed suit and enacted a phosphate ban for dishwasher detergent, while many other states have banned the use of high-phosphate laundry detergents. The 2015 watershed stormwater survey and shoreline survey indicate that a significant amount of phosphorus is delivered to the Inlet as a result of soil erosion. By combining the land-use modeling results with estimated future loading increases from the build-out analysis, we can estimate the phosphorus load at full build-out. Currently, 62 kg of phosphorus enters Basin 1 annually; 86 kg of phosphorus enters Basin 2 annually, 25 kg/yr of which comes from Basin 1; and 1,202 kg of phosphorus enters Basin 3 annually, 37 kg/yr of which comes from Basin 2. According to the build-out analysis, Basins 1, 2, and 3 will experience a 53% increase (to 95 kg/yr), 55% increase (to 133 kg/yr), and 51% increase (to 1,819 kg/yr) in phosphorus loading at full build-out (2058), respectively. Watershed load contributed the greatest increase in phosphorus loading to the three basins. At full build-out, in-lake phosphorus concentration could be as high as 22.5, 16.6, and 14.5 ppb in Basins 1, 2, and 3, respectively. Ideally, if all NPS pollution sites identified in the 2015 watershed and shoreline surveys were treated with BMPs, and all new development contained proper phosphorus controls, these annual phosphorus loadings would be greatly reduced. Without a monitoring program in place to determine these pollutant levels, it will be difficult to track successful reduction efforts. However, there are various spreadsheet models available that can estimate reductions in these pollutants depending on the types of BMPs installed. Phosphorus and nitrogen reductions can be input to the LLRM model developed for this project to estimate the response of the Inlet to the reductions. Maintaining an Organizational Structure for Implementation. Since the watershed spans multiple municipalities, a cooperating group representing the watershed towns and associations should be established for the implementation of future efforts in the watershed and to help coordinate the implementation of restoration activities. Fortunately, LWA has already stepped up to take on this role, but other prominent groups, including Moultonborough Conservation Commission, Lees Pond Association and the Suissevale/Balmoral neighborhood associations, should also be involved. These groups should try to involve the various business interests in the watershed to allow for a full consideration of all issues relevant to an effective, efficient, and cost-effective restoration program. Establishing a Funding Mechanism. A long-term funding mechanism should be established to provide financial resources for restoration actions, and should be guided by an advisory committee that would include representatives from watershed towns, lake residents, LWA, businesses, associations, land trusts, and more. 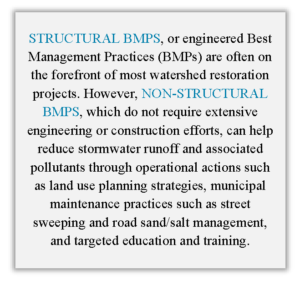 In addition to construction and organizational management costs, consideration should also be given to the type and extent of technical assistance needed to design, inspect, and maintain stormwater BMPs. Technical assistance costs for the annual field monitoring program should also be considered. Funding is a critical element of sustaining the restoration process, and once it is established, the restoration plan can be fully vetted and restoration activities can move forward. Synthesizing Restoration Actions. This watershed restoration plan provides prioritized recommendations to support restoration (e.g., structural/nonstructural recommendations for priority areas). These recommendations, or action items, need to be revisited and synthesized to create a unified watershed restoration strategy. Once a funding mechanism is established, the lake watershed restoration program should begin in earnest by developing detailed designs for priority restoration activities on a project-area basis and scheduling their implementation accordingly. Continuing the Community Participation Process. The development of the plan has greatly benefited from the active involvement of an engaged group of watershed stakeholders with a diversity of skills and interests. Plan implementation will require their continued and ongoing participation, as well as additional community outreach efforts to involve even more stakeholders throughout the watershed. A sustained public awareness and outreach campaign is essential to secure the long-term community support that will be necessary to successfully implement this project. Developing a Long-Term Monitoring Program. Although current monitoring efforts are strong, a detailed monitoring program (including ongoing monitoring of watershed tributaries and other surface waters, such as Lees and Garland Ponds) is necessary to track the health of the Inlet, particularly when the overall goal of the watershed restoration planning process is the protection of the long-term health of this waterbody (refer to Section 5.2). Establishing Measurable Milestones. A restoration schedule that includes milestones for measuring restoration actions and monitoring activities in the watershed is critically important to the success of the plan. In addition to monitoring, several environmental, social, and programmatic indicators have been identified to measure the progress of the plan. These indicators are listed in Section 5.3, and are intricately tied to the action items identified in the Action Plan in Section 5.2.